MONTGOMERY, Ala. — Suspended Alabama Chief Justice Roy Moore, also known as the “Ten Commandments judge,” announced on Wednesday that he is resigning from the state Supreme Court to run for the United States Senate. “Our first president in his farewell address said very simply, ‘The virtue of morality is a necessary spring of popular government. Who, that is a sincere friend to it, can look with indifference on attempts to shake the foundation of the fabric? '” he noted. Moore outlined that the foundations of the nation are being shaken on a variety of levels, including in matters of protecting the unborn, the institution of marriage and religious liberty. He said that there also needs to be a return to the original intent of the U.S. Constitution. 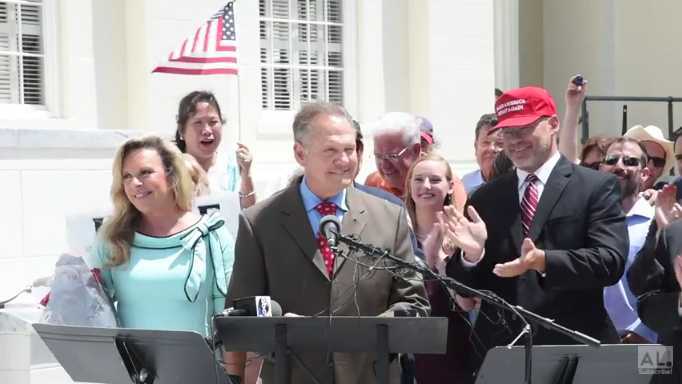 Moore again drew applause when he proclaimed the need to stand for God as he was asked by a reporter about his suspension from the Alabama Supreme Court. In May, after receiving a complaint about Moore from the Southern Poverty Law Center and other entities, the Alabama Judicial Inquiry Commission (JIC) announced that it had filed ethics charges against the chief justice and suspended Moore while he faced a trial before the Court of the Judiciary (COJ). Last week, a special, randomly-selected Supreme Court panel affirmed the COJ’s conclusion. Moore had likewise been removed from his chief justice seat in 2003 for refusing to remove a Ten Commandments monument from the court rotunda, but was re-elected by the people in 2012. Fellow Alabama Supreme Court Justice Tom Parker, who supports Moore and believes the chief justice’s punishment was unjust, announced on Wednesday that he will now run for Moore’s seat on the bench.